What Should You Do When Two Talents Contradict Each Other? 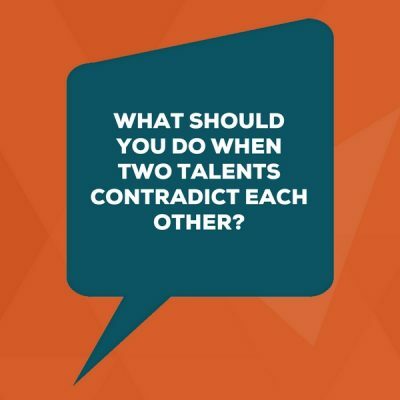 In this episode, Lisa answers the question: What should you do when two talents contradict each other? Don’t worry — you’ll be fine if you work on situational fluency and communication. You’ll find lots of StrengthsFinder, leadership, and team tools on our Strengths Resources page. I said, “Sounds interesting, tell me more.” He clarified by saying that his Ideation is the opposite of his Consistency talent theme because Ideation makes him come up with constantly new ways of doing things while his Consistency talent theme makes him want to do things the same every time to be efficient and clear. One of the beautiful things about virtual events is that they’re often big. So with 250 people in the same training room, it was possible to find someone else with those two talent themes. From that conversation, you can see the two important things to explore in your own Top 5 and in the Top 5 of your team members so that you can be extra effective when you work together. It comes down to (1) Situational Fluency and (2) Communication. By situational fluency, I mean being able to bring your best to a situation or challenge that comes up at work. Let’s use Deliberative and Activator as the example StrengthsFinder talent themes because they’re simple to understand, even if you haven’t done anything yet with CliftonStrengths. You’ll often hear people using a car metaphor to describe Deliberative as a talent that likes to put on the brakes — to stop or to think carefully about risks before acting. You’ll often hear about Activator as a talent theme that likes to push the accelerator and get going. Now think about your own talents in a tough situation at work. You’ve put 20 million dollars into a product launch that failed. Everyone thought it would bring about 100 million dollars in revenue last year, and instead, you lost money. Half of the team wants to kill the product and cut the losses. Half of the team wants to tweak it and try to fix some issues before doing something so drastic. Meanwhile, you’re bleeding out cash and the board expects a plan by next week. Your team has been spinning in circles. Now think about your personal talent themes. Which ones make you feel cautious? Which ones help you feel brave? Which ones put you into high collaboration mode? Which ones make you go into deep thinking? Depending on the situation, you might need different things at different times. So, if you think, “Yikes, I have two strengths that can’t really work together well” — then dig into it more because, instead, you can think of it as having more tools for a given situation. For example, go back to the car metaphor. You have headlights on the exterior and you have dash lights inside of the car. Think of those two as if they’re talent themes. If it gets dark outside, you turn on the headlights so you can see. And in the dark, you don’t need so much of those interior lights, so they go dim. Otherwise they’re distracting. They’re too much for the situation. Your talents are the same. In one situation, you turn it up. In another situation you turn it down. In some cases, both are in use, but one is bright and one is dim. Think of your talents like that. You can control how bright or dim they are. You can bring the right light to the situation. That’s situational fluency. Rather than bringing all of you all the time, you bring the part that serves the situation. So watch for this. Next time you face a tricky challenge or debate like the example I gave you about killing the product, do a quick, mental run-through of your talent themes to consciously decide which ones (and how much of them) to bring to the situation. What’s funny is that this comment comes up in nearly every workshop. It’s because people imagine these paradoxes inside themselves and they realize the outside world may not be able to make sense of it. Most of us have a bunch of these. I can think of lots of personal paradoxes. Sometimes I’m a workaholic. Sometimes I’m a playaholic. Sometimes I’m a foodie food snob. Sometimes I eat green beans out of a can. Sometimes I’m a luxury buyer. Sometimes I go to thrift stores. So if you fear you might be perceived as “of two minds” or someone who seems to act inconsistently, be sure to bring it up in conversation. This is why I offered this section on communicating your paradoxes. Of course, before you communicate it, you need to be able to understand it yourself. For example, I talked to a person recently after a strengths-based leadership speech. She said this was insightful because her Activator shows up constantly in meetings. When there’s small talk, she wants it to hurry up and be done. When people schedule three meetings and you have meeting deja vu because the same things keep coming up over and over again, her Activator is going crazy. It’s dying for a little less talk and a lot more action. She also has the Deliberative talent. It doesn’t take up many thoughts in her head during meetings. But when she has a big decision to make, it’s prominent. When she needs to consider a complex situation, she leans on Deliberative heavily. Her takeaway was that her direct reports hear her saying, “Let’s do this” in meetings. And when she writes emails about big decisions, they hear her say “Let’s slow down for a sec.” She realized that’s why they see her as indecisive but she doesn’t see herself that way. And she left that event knowing that the simple act of communicating this seemingly opposite viewpoint is exactly what her team needs in order to make sense of her two modes. 1) Apply Situational Fluency. Pick a talent and think about when it needs to be the bright headlight you lead with and what situation calls for the dimmers. Know this in advance so that you can bring the situation what it needs. 2) Communicate So Your Paradoxes Do Not Confuse People. Spend the week watching for your potential paradox-perceptions. Where might you look like you’re of two minds? How can you make sense of these two things that live in perfect harmony inside of your head so that others around you know what to expect of you and where these two perspectives come from?